Fluid carcinoembryonic antigen (CEA) and amylase concentrations in resected cystic lesions of the pancreas. A, Carcinoembryonic antigen level in the fluid aspirated from 79 resected cystic lesions of the pancreas. IPMN indicates intraductal papillary mucinous neoplasm; MCN, mucinous cystic neoplasm; and SCA, serous cystadenoma. “Other” includes benign uncharacterized cysts (4), cystic neuroendocrine tumors (3), solid pseudopapillary tumor (2), ductal adenocarcinoma (2), enteric duplication cysts (2), cystic acinar cell carcinoma (1), acinar cell cystadenoma (1), and lymphangioma (1). To convert CEA to micrograms per liter, multiply by 1. B, Amylase concentration in the fluid aspirated from 66 resected cystic lesions of the pancreas. “Other” includes cystic neuroendocrine tumors (3), ductal adenocarcinoma (2), enteric duplication cysts (2), benign uncharacterized cysts (1), solid pseudopapillary tumor (2), cystic acinar cell carcinoma (1), retention cyst (1), and lymphangioma (1). To convert amylase to microkatals per liter, multiply by 0.0167. Objective To define how patients with pancreatic cysts are being diagnosed and treated. Setting University-affiliated tertiary care center. Patients Four hundred one patients evaluated in the Department of Surgery between January 2004 and December 2007. Main Outcome Measures Clinical management, histological diagnosis, and results of surveillance. Results Pancreatic cysts were incidentally discovered in 71% (284 of 401) of patients. There was no statistically significant difference in age (60.4 vs 63.1 years; P = .10), cyst size (31 vs 27 mm; P = .12), or histological diagnosis between symptomatic patients and patients with incidentally discovered cysts. Whereas the majority of symptomatic patients had their cystic neoplasms resected on diagnosis, 50% (142 of 284) of incidentally discovered cysts were initially managed nonoperatively. Of the patients who were managed with surveillance, 13 (8%) subsequently underwent resection after a median of 2.1 years because of an increase in cyst size, development of symptoms, increasing tumor markers, worrisome endoscopic ultrasonography findings, or patient anxiety. The most common diagnosis among resected lesions was either main-duct intraductal papillary mucinous neoplasm (25%) or branch-duct intraductal papillary mucinous neoplasm (23%). Invasive cancer was found in 29 of 256 (11%) resected cystic neoplasms, 9 of which were incidentally discovered, and in 7% (1 of 13) of patients who underwent watchful waiting prior to resection. Conclusions Incidentally discovered pancreatic cystic neoplasms composed 71% of our series, of which 50% were immediately resected. Subsequent morphologic changes or development of symptoms prompted an operation in 8% of patients after a period of surveillance. Invasive malignancy was present in 11% of all resected specimens but in 38% of main-duct intraductal papillary mucinous neoplasms. Even in the recent past, most pancreatic cysts were commonly considered inflammatory in nature.1-3 Over the past 2 decades, however, experience has shown that the majority of pancreatic cystic lesions are neoplasms, including intraductal papillary mucinous neoplasms (IPMNs), mucinous cystic neoplasms (MCNs), or serous cystadenomas.4,5 With the widespread use of abdominal imaging, asymptomatic, incidentally discovered cystic lesions are being identified in the pancreas much more frequently.4-6 Because these lesions may be precursors of malignant change or already harbor a cancer, the clinician and the patient face the choice between too much or too little treatment: the risk of morbidity and mortality from surgical resection vs the danger of missing the opportunity for cure. 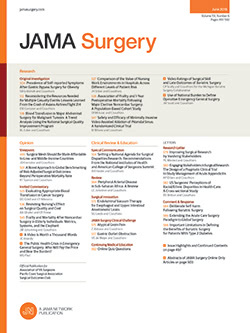 Prior studies have demonstrated that resection before progression to invasive cancer, even with carcinoma in situ, leads to a 5-year survival of up to 100% in contrast to 55% to 60% when there is invasive cancer.7-9 The challenge is therefore to choose accurately between preemptive resection and surveillance. This decision is often based on circumstantial evidence, physician bias, and the comorbidities and anxieties of the patient. The purpose of our study was to evaluate a modern series of patients with pancreatic cystic lesions at a high-volume institution. We focused on the evaluation and management of the incidentally discovered lesion and updated and expanded on our prior reported experience.4 Additionally, we reported on our experience with endoscopic ultrasonography (EUS) and fine-needle aspiration (FNA) as differential diagnostic aids in the management of these lesions. A retrospective review of a prospectively collected database from the Department of Surgery identified 401 patients with pancreatic cystic lesions between January 2004 and December 2007. We used the hospital's electronic medical records, office medical records, and referring physicians' and institutions' information to record clinicopathological data. Patients were considered asymptomatic if the cystic lesion was diagnosed on imaging performed for nonspecific abdominal pain or symptoms of a nonpancreatic origin. Clinical data collected included computed tomography (CT) findings, EUS characteristics, cyst-fluid cytology results, and tumor markers obtained by FNA. The cysts were described according to size (greatest diameter on cross-sectional imaging at the time of presentation), location, and presence of a mural nodule, calcification, or septations. Perioperative morbidity and mortality and postoperative length of stay were obtained from the hospital records. Histological diagnosis was obtained from the pathology report in all patients who underwent surgical resection of their cysts. In addition to the diagnosis, pathological data included cyst size, presence of nodules, communication with the main duct, and presence of septations. Patients placed under surveillance were followed up by contrast-enhanced CT or magnetic resonance imaging (MRI)/magnetic resonance cholangiopancreatography (MRCP) at 6-month intervals. If there was no substantial change in cyst size after 2 scans, imaging was performed at yearly intervals. This study was approved by the institutional review board. Between January 2004 and December 2007, 401 patients were evaluated for a pancreatic cystic lesion in the Department of Surgery. Clinicopathologic factors are listed in Table 1. The majority of patients were women (61%), and the median age was 62 years. Cysts were more commonly located in the body/tail region (42%) than in the head (37%) or neck (5%) of the pancreas. Multiple cysts were identified in 16% of patients. Mean and median cyst size were 28 mm and 20 mm, respectively (range, 3-195 mm). Most cysts were incidentally discovered, with only 29% of patients having symptoms clearly attributable to the pancreatic lesion. When symptomatic, half of the patients had abdominal pain, and almost one-third had weight loss or pancreatitis. Nausea, vomiting, jaundice, malabsorption, recent-onset diabetes mellitus, palpable mass, and early satiety were less common manifestations. There was no statistically significant difference in any morphologic characteristic (size, location, etc) between asymptomatic and symptomatic patients. At the time of diagnosis, 142 of 284 (50%) of the patients with incidentally discovered cysts were taken to surgery, compared with 100 of 117 (85%) of the patients with symptomatic cysts (P < .001). A total of 159 patients were initially managed with observation, with a mean and median follow-up time of 19 months and 13 months (range, 1-107 months), respectively (Table 2). Of these patients, 142 were asymptomatic; they were older (66 vs 60 years; P < .001) and had significantly smaller cysts (mean [SD], 16  vs 36  mm; P < .001) than asymptomatic patients who underwent an operation. Branch-duct IPMN was the presumed diagnosis in 77% (109 of 142) of these cases. One patient developed a pancreatic mucinous adenocarcinoma in the setting of stage IV prostate cancer; hence, no resection was offered. Eight percent (13 of 159) of all patients initially under surveillance had an operation after a median follow-up of 25 months. All of these patients had follow-up imaging, 8 of them at 2 or more points. The most common reason for an operation was an increase in cyst size (n = 9 patients). The mean and median increases in size were 13 mm and 14 mm (range, 2-21 mm), respectively. One patient developed recurrent bouts of mild pancreatitis; 1 had increasing tumor markers; 1 had positive EUS-guided FNA cytology results indicating adenocarcinoma; and in 1 case, the operation was undertaken because of patient anxiety. In 3 of 13 cases, the presumptive clinical diagnosis differed from the final pathological examination: an undetected main-duct component with borderline malignancy was seen in 1 case and “multifocal benign cysts” in another, both having been clinically labeled as branch-duct IPMNs; the third case was initially diagnosed as a serous cystadenoma but resection (prompted by an elevated carcinoembryonic antigen [CEA] level) disclosed an MCN-adenoma. The remaining 10 patients had been correctly diagnosed by the clinician as having branch-duct IPMN (6), combined IPMN (1), serous cystadenoma (1), MCN (1), and lymphoepithelial cyst (1). All of these patients were initially managed with observation on the basis of small cyst size, benign cyst appearance, or patient reluctance to surgery in 1 case. Among the 117 symptomatic patients, 16 (14%) were managed with observation; branch-duct IPMN was the presumed diagnosis in all of them. These patients had very mild and transient symptoms, the median cyst size was 12 mm (range, 8-23 mm), and none of them had solid components. Over the 4-year period, 193 patients were evaluated with 218 EUS examinations. Fifty-nine patients were symptomatic and 134 had incidentally discovered cysts. Many of these studies (62%) were performed at Massachusetts General Hospital, with the remainder being performed in community hospitals. Endoscopic ultrasonography was performed in 47% (134 of 284) of patients with incidentally discovered cysts, and fluid for cytological examination was obtained in 78% (105 of 134). Adenocarcinoma was diagnosed by cytological analysis in 6 cases; however, this was histologically confirmed in only 2 cases (1 invasive IPMN and 1 carcinoma in situ). The remaining 4 patients had borderline IPMN (2), neuroendocrine cystic neoplasm (1), and MCN adenoma (1). The remaining 99 cytology results showed nonmalignant epithelium (37), atypical cells (18), unsatisfactory for evaluation (29), or were otherwise “nonspecific” (15). Of these 99 patients, 60 underwent resection, and 4 patients had an IPMN with adenocarcinoma. Their cytology results were reported as atypical cells (3) and “nonspecific” (1). Stains for mucin were positive in 51 patients, of whom 34 underwent resection; the pathology results showed a mucin-producing tumor (IPMN or MCN) in 28 patients, a serous cystadenoma in 4 patients, a lymphoepithelial cyst in 1 patient, and a benign epithelial cyst in 1 patient. Fluid CEA levels were obtained in 84 patients, 46 of whom had an elevated level (≥192 ng/mL [to convert to micrograms per liter, multiply by 1], according to Brugge et al11). Twenty-six of these patients (56%) underwent an operation, and the majority (23 of 26) had an IPMN or MCN. Carcinoembryonic antigen values greater than 10 000 ng/mL were found in 10 patients (7 IPMN and 3 MCN), and none of them had cancer. Of the 38 patients with a low CEA value (<192 ng/mL), 22 were operated on; 14 had an IPMN or MCN, 3 with a carcinoma in situ. Fluid amylase level was measured in 69 patients and was found to be elevated (≥250 U/L [to convert to microkatals per liter, multiply by 0.0167]) in 53. The final histological diagnosis in patients who underwent resection who had an elevated amylase level was IPMN (17), MCN (6), serous cystadenoma (1), neuroendocrine tumor (1), and other benign lesions (3). Scatterplots of the CEA and amylase values in cyst fluid from both symptomatic and incidentally discovered cystic lesions that were operated on are shown in the Figure. A mural nodule was reported by CT/MRI in 12 patients. Endoscopic ultrasonography confirmed all of these and identified an additional 8 patients with a mural nodule. Of the 18 patients who underwent a resection, a nodule was reported by gross pathological examination in only 9 cases. Two of the nodules were reported by EUS and not by CT/MRI. Based on the sonographic appearance, the endoscopist suggested a specific diagnosis for 88 of 134 (65%) of the incidental cysts. This diagnostic impression was confirmed by the final pathological examination in the resected specimen in 52% (25 of 48) of the cases. Endoscopic ultrasonography examination correctly diagnosed 13 of 26 IPMNs, 10 of 16 MCNs, and 2 of 3 serous cystadenomas in this subgroup. Retrospectively, EUS clearly influenced the clinical management in 54 of 134 (40%) incidentally discovered lesions. Endoscopic ultrasonography was performed in 50% of symptomatic patients (59 of 117), and the majority (54 of 59) underwent an operation. Fine-needle aspiration was performed in 46 patients, and 40 of them had results from cytological analysis. Four of these cysts were reported asadenocarcinoma, and all were confirmed by final pathological examination. However, 7 additional cancers were diagnosed on final pathological examination among the 36 remaining patients whose cytology results had been reported as negative (5) and atypical cells (2). Carcinoembryonic antigen levels in the cystic fluid were obtained in 33 of 59 patients with symptomatic cysts. Elevated levels (≥192 ng/mL) were found in 19 patients, and 16 of these patients proved to have mucin-producing neoplasms at final pathological diagnosis. Twelve of the 14 patients with low CEA levels underwent an operation and a mucin-producing tumor was found in 8. Fluid amylase level was measured in 27 of 59 patients. It was found to be 250 U/L or higher in 20 patients, and 19 of these cysts were resected and reported to be IPMN (12), MCN (4), enteric duplication cysts (2), and ductal adenocarcinoma (1) (Figure). Endoscopic ultrasonography reported mural nodules in 11 patients with symptomatic cysts, and all of them underwent an operation. Computed tomography and/or MRI had also identified the nodules in 3 of these patients. As in incidentally discovered cysts, the final pathological examination only found nodules in a few of these patients (3), 1 in whom the nodule had been seen by EUS but not by CT/MRI. Based on morphology, EUS suggested a diagnosis in 46 symptomatic patients. This matched the final diagnosis in 19 (41%). Endoscopic ultrasonography correctly identified 14 of 30 IPMNs and 4 of 8 MCNs; nevertheless, it misdiagnosed 1 serous cystadenoma and 2 ductal adenocarcinomas. A total of 256 resections were performed. Pancreatoduodenectomy and distal pancreatectomy, with equal frequency, accounted for 88% of the procedures (Table 3). The most common diagnosis for all resected lesions was main- and branch-duct IPMN (48%), followed by MCN (18%). Invasive malignancy was present in 11% of all resections (Table 4). Among the tumor types, only main-duct IPMN had a high prevalence of malignancy: 24% carcinoma in situ and 24% invasive cancer. At the time of diagnosis, 85% (100 of 117) of symptomatic patients were operated on. The most common diagnosis within the symptomatic patients was also IPMN (57%), followed by MCN (16%). Invasive malignancy was present in 20% (20 of 101) of symptomatic patients. Of the patients with incidentally discovered cysts, 55% (156 of 284) eventually underwent an operation. There was no significant difference in the histopathological result of these patients from those with symptoms except that there was a statistically greater percentage of invasive cancers in symptomatic patients compared with asymptomatic patients (20% vs 5%; P < .001). Surgical mortality was less than 1% (1 of 255). A complication developed in 18% of patients, with a pancreatic fistula being the most common. Many of the patients with a pancreatic fistula developed additional complications, including intra-abdominal infection (4%), pneumonia (3%), wound infection (2%), and sepsis (1%) (Table 3). Other reports have generally validated these guidelines on the basis of the findings on resected pancreatic cystic lesions,9,15 most of which have been symptomatic. We found invasive cancer in 29 of 255 (11%) of the cystic lesions that were resected; however, the overall incidence of invasive cancer in this cohort (although we do not have pathological confirmation for patients under observation) is only 7%. The rate of invasive cancer was much higher in patients with main-duct IPMN (24%), of whom only 19% were asymptomatic. By providing a large series of pancreatic cystic neoplasms, 71% of which were found incidentally, this study gives further support to the safety of the Sendai guidelines. These tumors were relatively small on average and were not producing symptoms. One hundred fifty-nine patients did not undergo resection at the point of diagnosis but were kept under surveillance with CT or MRI/MRCP imaging. Thirteen of the 159 eventually underwent resection because of symptoms, growth, or other new findings. Only 1 of these 13 patients had a lesion containing an invasive cancer. These findings confirm the safety of surveillance in a selected population, which probably accounts for a substantial majority of newly discovered pancreatic cystic lesions, especially the very common subcentimeter branch-duct IPMN. However, the short follow-up warrants caution and surveillance with cross-sectional imaging will need to continue indefinitely until more information regarding the long-term natural history of these lesions is established. When compared with our prior experience with pancreatic cysts from 1997 to 2002,4 the present series shows that the proportion of incidentally discovered cysts has nearly doubled (from 36% to 71%) and that the mean size of these asymptomatic lesions is smaller (3.3 vs 2.7 cm). Our conduct toward the incidentally discovered cyst has also changed markedly from an aggressive resectional policy (close to 80%) to the current 50%. Additionally, the average size of the symptomatic lesions has decreased from 4.6 cm to 3.1 cm, and the prevalence of malignancy (in situ and invasive) is also lower (40% vs 26% in symptomatic cysts and 17% vs 7% in those incidentally discovered). These changes are likely due to increased awareness of pancreatic cystic lesions by clinicians and radiologists, as well as the improved resolution and availability of cross-sectional imaging. We currently recommend resection for symptomatic patients and those with lesions measuring 30 mm or more or with a solid component. One of our aims was to retrospectively review the contribution of EUS to the management of cystic lesions of the pancreas. We evaluated not only the data obtained from our institution, but also the information that referred patients brought with them from community hospitals, since EUS is now widely available. Nearly half of the patients in this series underwent EUS, and somewhat unexpectedly, we found that the proportion of patients with incidentally discovered cysts who underwent this test was the same as in the group with symptoms even though the majority of the latter would require resection regardless of the information obtained by this test. The role of EUS and FNA for cyst-fluid sampling is still being explored and clarified with respect to improving the differential diagnosis, detecting cancer, and aiding in surveillance. Endosonic ultrasonography can be particularly helpful in demonstrating septae and solid components, communication with pancreatic ducts, and guiding FNA for cytological examinations and fluid analysis. Although the retrospective nature of this study precludes a rigorous analysis, we found that morphologic features derived from EUS allowed the endoscopist to suggest a diagnosis in about two-thirds of cases and that this matched the final histopathological diagnosis in 41% and 52% of symptomatic and asymptomatic cysts, respectively. One important finding was related to the detection of nodules, where EUS performed more sensitively than cross-sectional imaging, although the pathologist confirmed the presence of nodules in less than 50% of those patients. The reasons for this lack of correlation are unclear, and only prospective studies will be able to determine if some of these presumed nodules represent debris. The yield of cytology, similar to other reports,16,17 was disappointingly low since the majority of cancers (11 of 17) were not identified. Somewhat troubling was the high proportion of false-positive results for adenocarcinoma in the asymptomatic group (4 of 6). It is difficult from a retrospective study to determine how truly helpful EUS was. What is clear from this review is that its use is unsystematic. Since experience of the endosonographer and cytologist matter, perhaps EUS for evaluation of pancreatic cysts should be done only in high-volume centers. There is an ongoing need for tests that can accurately identify malignancy within pancreatic cysts, and other tumor markers, proteomics, or DNA analysis of cyst fluid should be carefully evaluated. One group19,20 reported that positron emission tomography with fluorodeoxyglucose F 18 can effectively discriminate malignant vs nonmalignant cysts, but this finding has not been confirmed.21 We are currently evaluating this modality. In summary, this contemporary experience shows that the majority of pancreatic cystic neoplasms are now incidentally discovered but provides evidence that, with the exception of main-duct IPMN, most cystic neoplasms of the pancreas—those that are asymptomatic, less than 3 cm in diameter, and free of nodules or solid components—can be managed safely with periodic surveillance using CT or MRCP. In this study, only 8% of patients underwent resection over the next several years, and only 1 of those patients developed a cyst with a microscopic focus of invasive cancer (which was still resected for probable cure). These observations have led to a major revision of our treatment strategy from aggressive advocacy of resection4 to a much more conservative, highly selective stance. The role of EUS in both the initial evaluation and subsequent surveillance of pancreatic cystic neoplasms continues to evolve. Correspondence: Cristina R. Ferrone, MD, Department of Surgery, Massachusetts General Hospital, 15 Parkman St, WAC460, Boston, MA 02114 (cferrone@partners.org). Accepted for Publication: August 24, 2008. Author Contributions:Study concept and design: Ferrone, Correa-Gallego, Warshaw, Brugge, Forcione, Thayer, and Fernández-del Castillo. Acquisition of data: Correa-Gallego, Warshaw, Forcione, and Thayer. Analysis and interpretation of data: Ferrone, Correa-Gallego, Warshaw, Thayer, and Fernández-del Castillo. Drafting of the manuscript: Ferrone, Correa-Gallego, Warshaw, Thayer, and Fernández-del Castillo. Critical revision of the manuscript for important intellectual content: Ferrone, Warshaw, Brugge, Forcione, and Fernández-del Castillo. Statistical analysis: Fernández-del Castillo. Obtained funding: Ferrone. Administrative, technical, and material support: Ferrone, Correa-Gallego, Thayer, and Fernández-del Castillo. Study supervision: Ferrone, Warshaw, Brugge, Forcione, Thayer, and Fernández-del Castillo. Previous Presentations: This paper was presented at the 89th Annual Meeting of the New England Surgical Society; September 26, 2008; Boston, Massachusetts; and is published after peer review and revision.